Tragus jewellery burst onto the scene in 2005, but has recently gained even more popularity. This subtle but unique look is being made popular by celebrities such as Scarlett Johansson and Rihanna, who’s red carpet shoots have brought the tragus into the mainstream once more. It is one of the most popular ear piercings out there, and another cartilage earring to add to the collection of piercing veterans. In this guide, you can find everything you need to know about getting your tragus pierced, from cost and types to proper aftercare. Of course, you might want to know what exactly your tragus is, and where the tragus piercing goes. Your tragus is that little triangular shaped piece of cartilage that sits above your ear canal. The purpose of the tragus is to actually collect sound from behind you, but it has also become an awesome place to get all sorts of piercings. This part of the ear is tougher than the earlobe, and usually, a 16 gauge size needle is used for the piercing. Because of its location, you will usually be asked to lie on your back or side so the piercing artist can get easy access. Apart from this, there is very little difference between the tragus and other ear piercings. Are you compatible with a Tragus Piercing? Not everybody can get a tragus piercing unfortunately. In some cases, a piercing artist may not perform the procedure because your tragus is too small. If your tragus is too small and is pierced anyway, it could cause a serious tear and leave permanent damage to your ear. There are still many viable alternatives, including rook earrings, which look just as impressive. How much does a Tragus Piercing hurt? The good news is that your tragus has very few nerve endings, which means less pain! The less good news is that you’re still getting a hollowed needle through your skin, so you will feel something. Your tragus cartilage is a bit thicker than the rest of your ear, so the pressure the piercing artist puts on your ear might seem uncomfortable. Don’t worry though, the worst of it is over in a split-second. The pain is definitely bearable and is often compared to that of an earlobe piercing, with a bit of extra pressure put on for the tragus. Of course all pain is relative to the person, but in general, it is no more than a 3/10 on the pain scale according to most people who get it done. How much does a Tragus Piercing cost? Tragus piercings should be the usual price for a cartilage piercing. Of course this will depend on the popularity of the studio itself, and of course how good the service actually is. This isn’t terribly expensive overall; you may just need to skip drinks with your friends one weekend, but it’s worth it, so you can show off your piercing the following weekend. 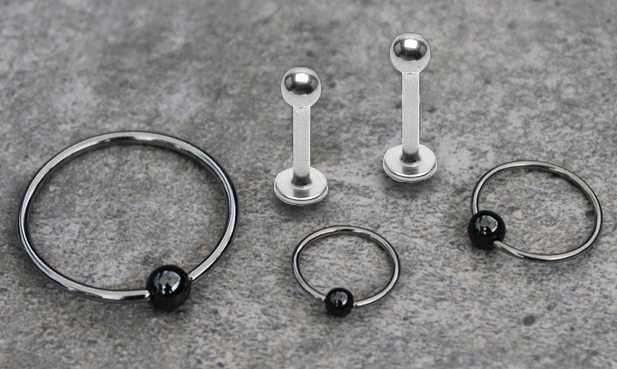 Don’t forget you will also want to pick up a nice, titanium barbell piercing or a titanium labret stud which you will like having in your ear for the duration of the healing period, which could be up to 6 months. The most important thing is to not simply go for the cheapest option, and make sure you are being pierced by a professional and experienced piercing artist. Below you can find some useful tips on finding a piercing studio that suits your needs. What are the different kinds of Tragus Piercing available? Apart from the standard tragus piercing which has been described above, there is also the anti-tragus piercing, which is located in the little triangular shaped spot just above the ear lobe, and beside the tragus. It is the same area where the cord of your headphones would rest. In terms of jewellery, it is a very versatile spot. Besides the traditional tragus studs, alternatives like tragus rings and labret studs are very popular. A curved barbell is also possible but it is recommended that you wait until the piercing has fully healed before trying this and stick to the original titanium piercing. 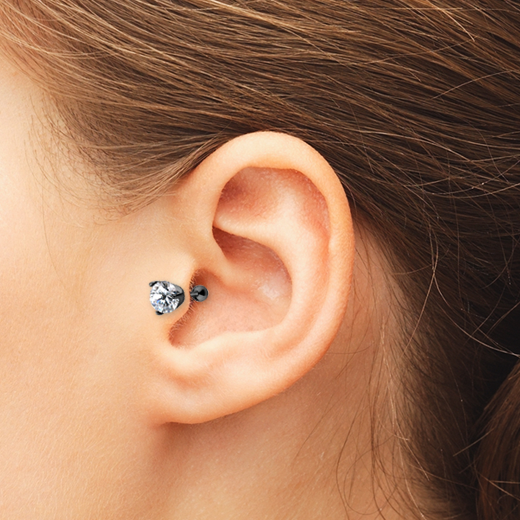 How should you prepare for getting your Tragus pierced? - If you have longer hair, it might be best to pull it up so that it doesn’t get in the way during the procedure. - Try not to wear any t-shirts or tops that are too tight, especially at the neck, so you don’t agitate the new piercing or get it caught in your clothes. - Clean your bed clothes before getting pierced. This way there is less chance of getting germs in your fresh new piercing. How long does it take for a Tragus Piercing to heal? Your tragus piercing can take anywhere between 3 and 9 months to heal, and possibly up to a year in some cases. Patience is key because there are no shortcuts to proper healing; but to prevent complications, be prepared to care for your new piercing by cleaning regularly and not touching it too much. After the first four weeks, you can use our healing oil for piercings to improve the conditions for your piercing to heal properly. You should absolutely not change your piercing for at least 3 months, but we would recommend that you go to a professional piercing studio when you change jewellery for the first time, as they can help make sure no damage is caused, and that the piercing is appropriately healed. 1. Make sure your hands are always thoroughly washed with antibacterial soap when cleaning the piercing. 2. A saline mix or one of our salt spray solution are great for cleaning in and around the pierced area. 3. Use some thick kitchen paper or a non-alcoholic cleaning swab to wash the area. 4. Move your piercing around a little bit to make sure the piercing is cleaned the whole way through. 5. Don’t clean more than twice a day, as this can cause irritation. 6. Alcohol or hydrogen peroxide-based cleaning solutions will only lead to more infection so be sure to avoid these. 7. Unless you have been instructed by a medical professional, avoid using chemical creams or ointments in the first 2 weeks as they could do more harm than good. - Pain and swelling which lasts more than 2 weeks. - Inflammation, redness and some pretty intense pain around the piercing. - Pus-filled sores in and around the pierced area. - In some extreme cases, there may even be smelly, greening discharge from the infected area. To avoid this, be sure to follow our proper aftercare instructions. There are some experts who believe that tragus piercings help with weight loss. Whether this is true or not, there are still some myths about the tragus piercing that people should not believe. True, there are fewer nerve endings, but you will always feel something; whether you find it painful or not is up to the individual. This simply isn’t true. You shouldn’t be getting piercings just to lose weight anyway, they are meant for fashion. Again, there is no truth to this. This is something that a salesperson will say to get you to buy the jewellery. Don’t buy into this.